11-15V DC or 23-30V DC voltage regulated version available for boats/yachts and RV's. Our RD07-12 SMD is Dimamble with either a low voltage PWM dimmer or with some line voltage dimmable transformer, please contact us with inquiries. Clearly the best choice for cabinet lighting, work stations, specialty furniture, display cases, shelf lighting, bar lighting, yacht Lighting and many others. Can be mounted to the surface or can be recessed installed with it's ultra thin profile. 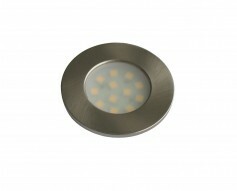 DIMMABLE used with our Low Voltage LED Dimmer found on our Accesories Page. -A variety of Finishes: White, Black and Brushed Nickel. Custom Colors available for OEM Clients. -Finished Sets with specified # of Lights, wiring layouts, power supplies, switches etc..
Our newest Low Voltage LED cabinet Puck light is now Dimmable. 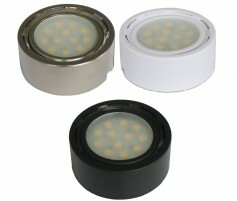 The Rd07-SMD light includes a surface mount bezel and recessable LED light engine that has 12 SMD LEDs (118 Lumens), a frosted or clear lense and emits little to no heat. 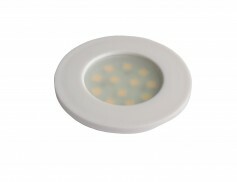 Recessed Cut Out Size: 1.75"
Great Choice for replacing your exiting cabinet lighting to Low Heat LED cabinet lighting.